Hey there lovelies! Blackheads, acne, pores, uneven skin tone... These are some of my skin concerns that I have. Not to mention the oily T-zone and dry cheeks. 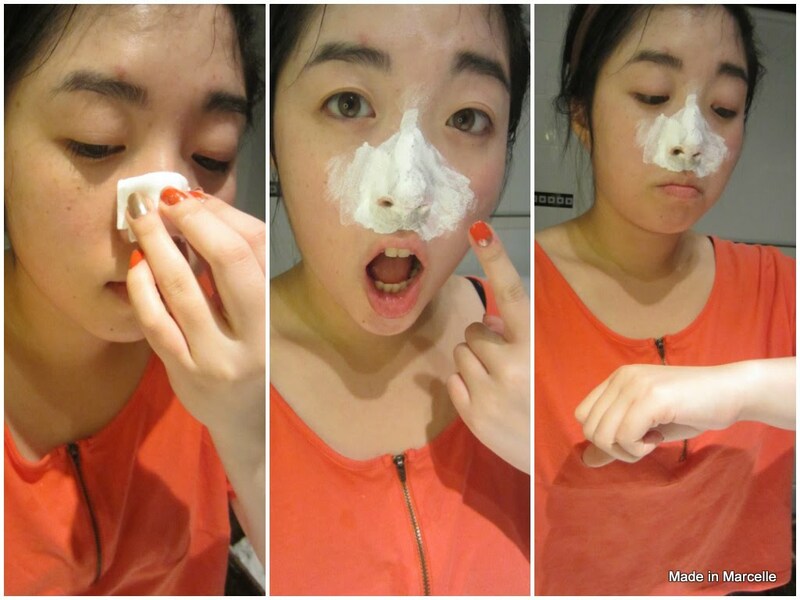 As much as one can try, some of these are not completely reversible such as having blackheads and large pores. Today, I am gonna share with you my skin care routine of how I take care of my skin to temporarily eliminate blackheads and prevent my pores becoming even larger. Start off with a cleansed, bare face. Step 1: Press on the silver powder onto nose using a wet cotton pad. Leave on for 10 minutes or until completely dry. Keep track of time by checking out your invisible wrist watch. After 10 minutes, wash off with luke warm water. I believe Biore has new packagings now. Shown in this post by Mary. Step 2: Apply the nose strip to wet nose and leave on until completely dry. While the nose strip was drying, I was checking out the packaginh and it said the above on the side of it. 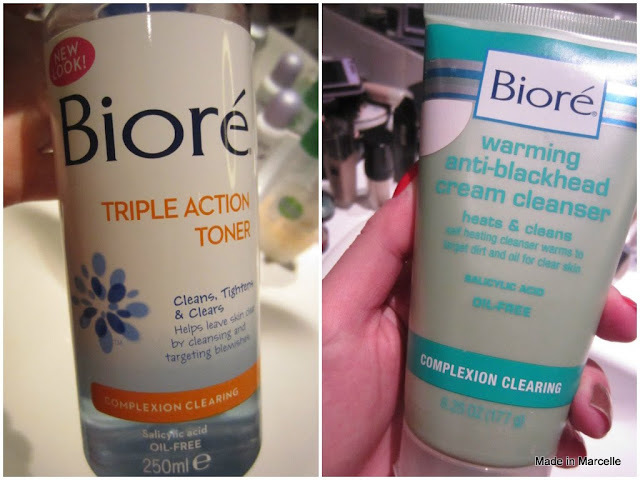 Then I realised I have two out of three of those other Biore products. Step 3: This is the not-so-fun, painful part. Once the nose strip is dry, slowly (or quickly if you're brave enough) peel the strip beginning at the edges. This step always makes me tear up from pain > __< Once it's been removed, wash away any residues with luke warm water. For about an hour immediately after taking off these nose strips, I always find my nose being very itchy. Does anyone else find that at all? I wonder if Mary experiences this as well. 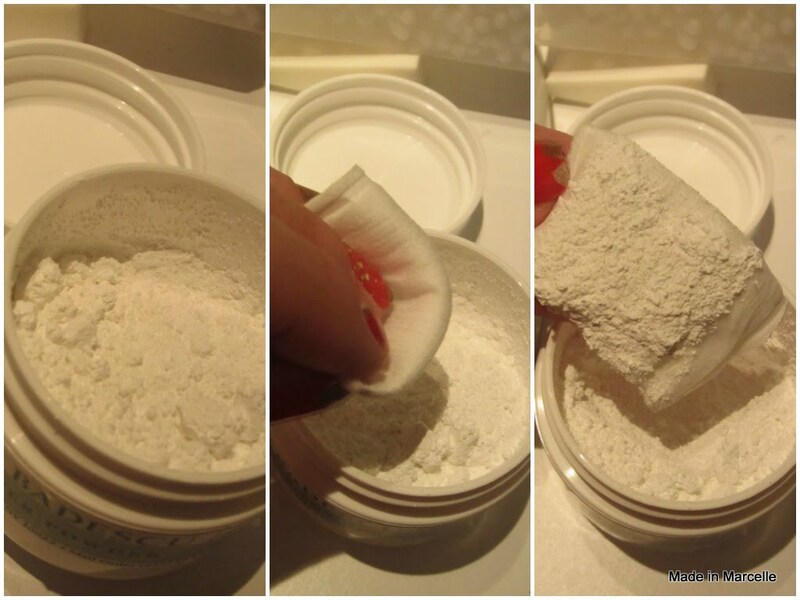 Step 4: Apply a thin layer of the refining mask and wait 5 minutes. That's right, only 5 minutes ;D Once the mask is completely dry, wash off with...you guessed it, luke warm water. Or as Clinique likes to call it, "tepid water". Step 5: After applying your favourite toner (I use Neutrogena Alcohol-Free Toner), apply the refining serum to areas with large pores - nose, side of nose on the cheek, forehead, etc. As the packaging claims, it does leave the skin shine-free. But knowing my skin and how quickly it oils up, the shine-free-ness did not last long. My experience with Clinique has seized ever since I tried out a sample of their Liquid Facial Soaps in Mild. It was an absolutely horrible experience because after one use, my skin felt like it was on fire. I could see my face becoming red, inflammed, and bumpy all over. My face was like this for a couple of days before settling down. After this horrific experience, I never purchased or used other Clinique products other than these ones from the Pore Minimizer range. Using these products won't guarantee you that you will have less blackheads and smaller pores, but it can prevent you from further damage. 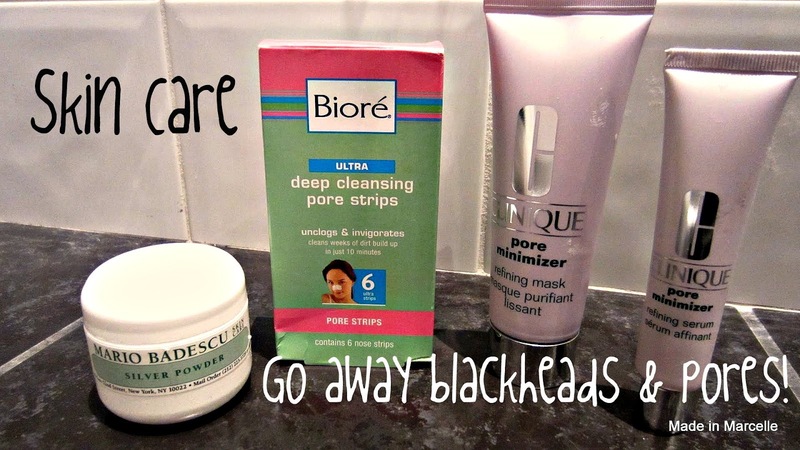 If I were to recommend just one of these products to you, it would have to be the Biore Ultra Deep Cleansing Pore Strips. The box I have now is probably my 10th box, and I already have a new one in my bathroom. Although the results are not permanent, there's something very satisfying about visually seeing your blackheads get eliminated, even if it only lasts for a couple of days. This is the only product that I have repurchased, and the only one that I will repurchase again in the future. I think Mary agrees with me when I say this. 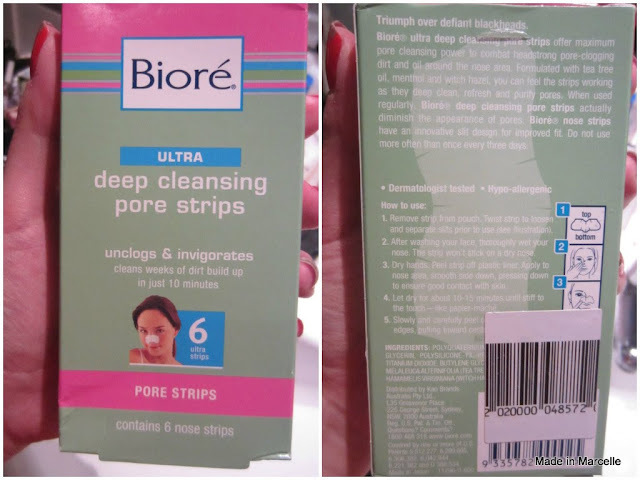 Be sure to check out her post here to read about what her take is on the Biore nose strip. What is your main skin concern and how do you manage it? 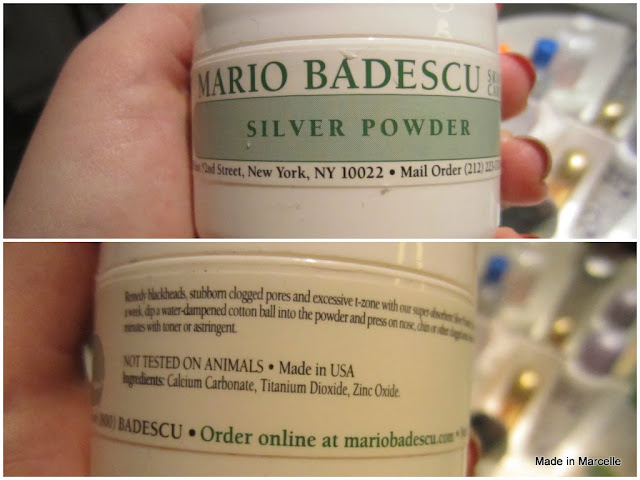 Is the Mario Badescu silver powder any good? Hey Ness!! I feel like I'm not using it properly so the result for me is not very satisfying unless I use it with a nose strip.